The current liturgical season is Epiphany. Epiphany is, first, a holiday observed on January 6th, and is also known as Three Kings Day. 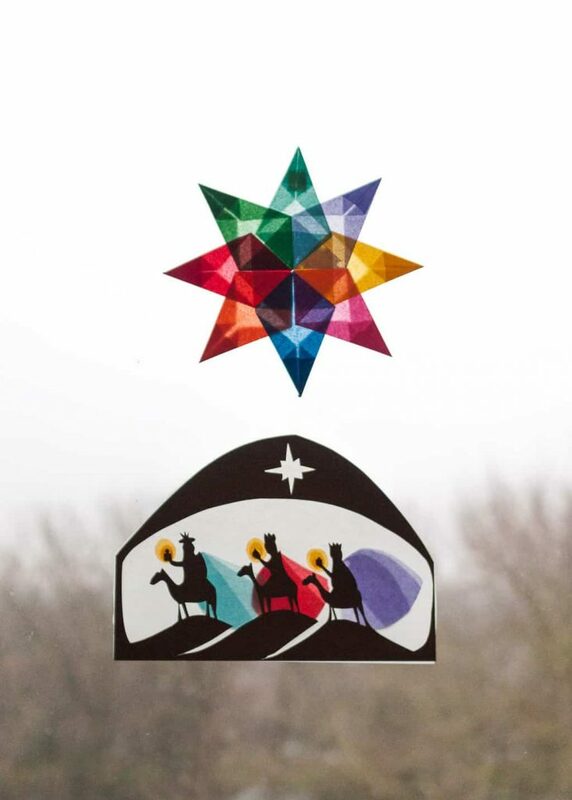 It commemorates the arrival of the wise men to see Jesus, and in a bigger-picture sense, the manifestation of Jesus. It is also the season that lasts for weeks after that day; some Christian denominations call this Epiphany, some call it Epiphanytide, and some think of it as Ordinary Time, and mark the weeks passing by referring to them the “Second Sunday after Epiphany,” for example. I am part of a Methodist church, and in the Methodist tradition, we practice the weeks after January 6th as the season of Epiphany. So while Three Kings Day was a little while back, I am still doing Epiphany activities and savoring the Epiphany season. 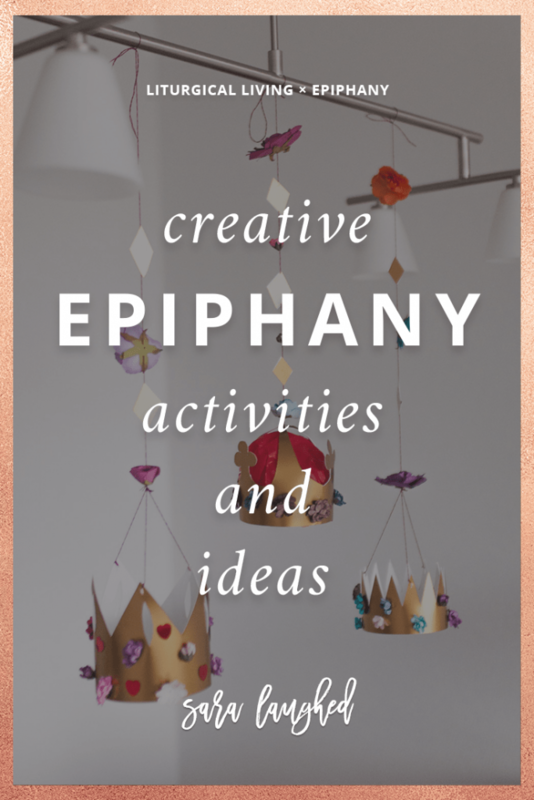 Today, I’m sharing a few Epiphany activities that you can try with your family or by yourself. 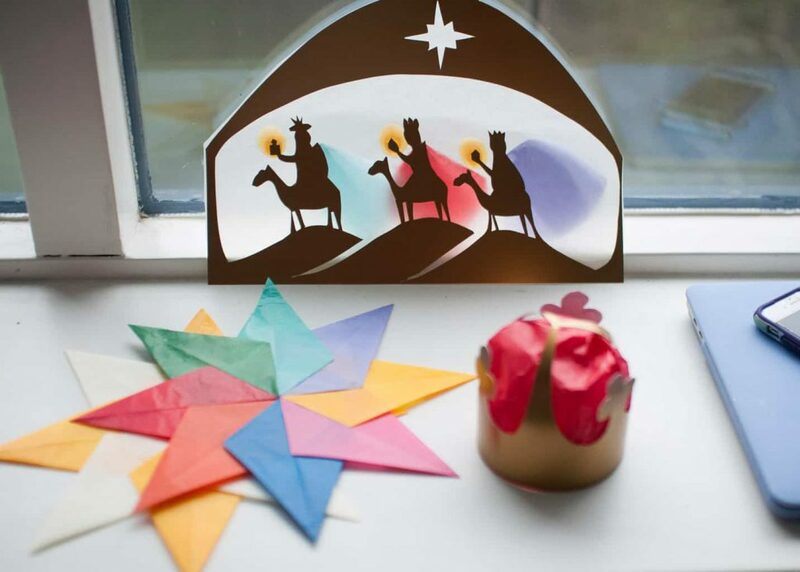 For Spanish children, Three Kings Day is much like our Christmas. 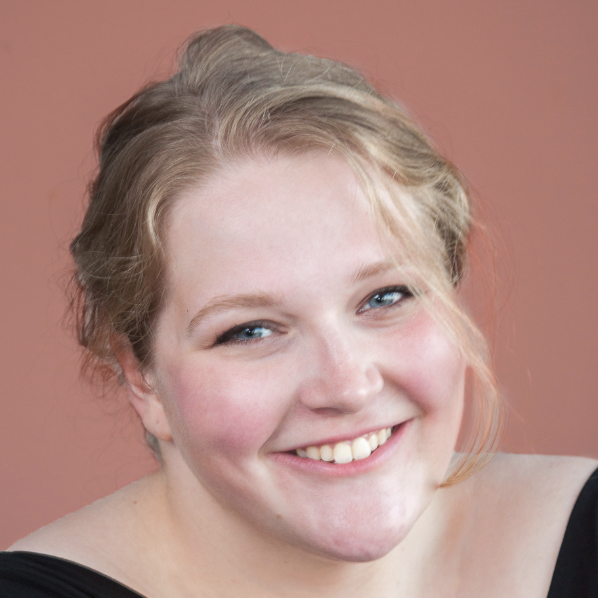 Weeks before, children write letters to the Kings, and each child tends to have her favorite King who she writes to. The children write explaining why they have been good and tell the Kings what presents they want. These letters are sent to “The Three Kings — East” via mail, passed to parents, or given to a man whose job is to collect these letters a few days before the holiday (The city pays for these professional Three King letter handlers!). Depending on the city, the Kings arrive by boat or helicopter, etc. On the evening of the 5th, the Kings arrive for a giant parade where they throw candy to seas of children riding on their parents’ shoulders. The parade includes a band, the special letter collectors, and (weirdly) people dressed as Roman soldiers. Confetti is thrown everywhere and children go home with their sweets. Before they sleep, families leave sweet cookies, a Spanish sweet called turron, and milk for the Kings and water for their camels. Children awake to presents the next morning. Common themes of Epiphany are manifestation and visitation. 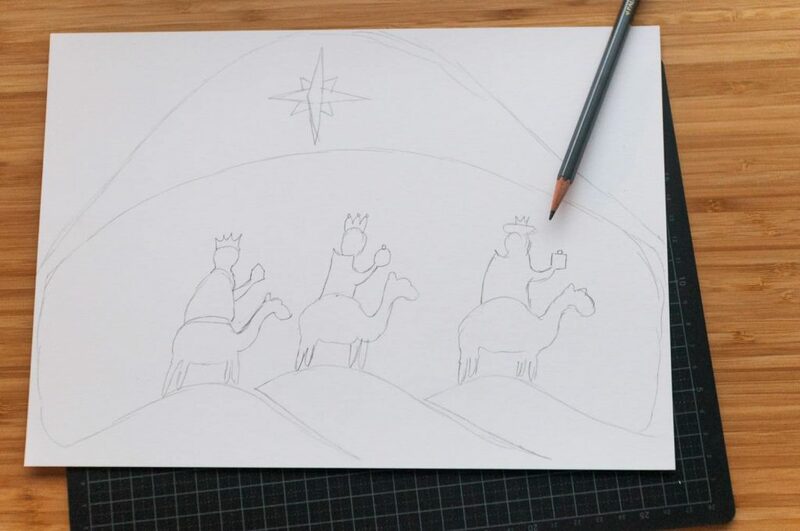 Visual themes are light, the three kings or wise men, and the star! I found this great idea on Pinterest, and used the tutorial by Brass Stacks and Basics. 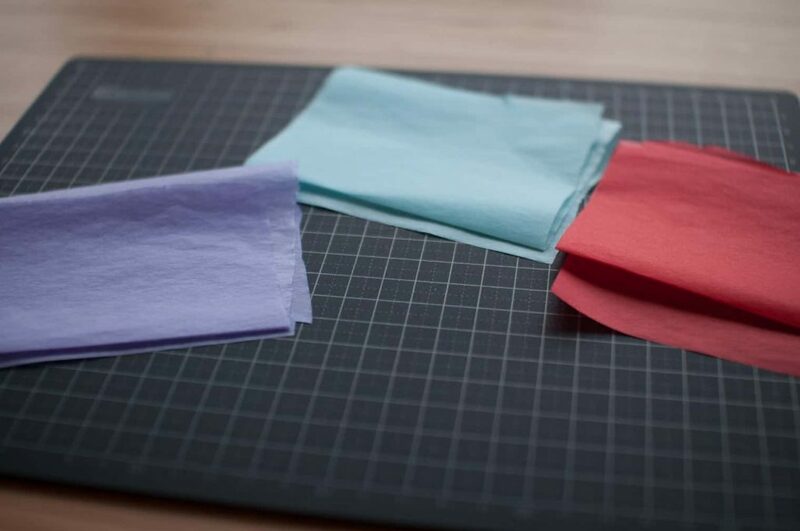 All you need is tissue paper, a pair of scissors, and a 3 x 5 index card (or a ruler). 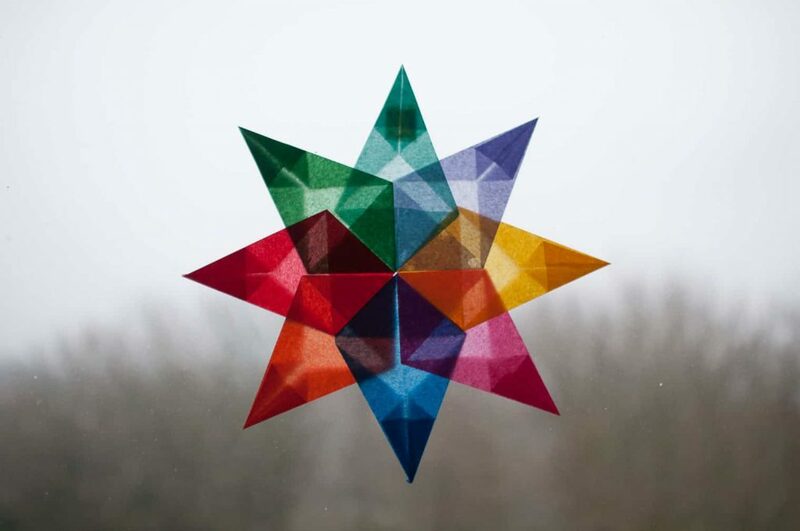 A few easy folds turn each piece of tissue paper into one-eighth of the star, and a few dots of glue bring them all together. This was inspired by a photo I found online, which didn’t come with a tutorial. I eyeballed it and ended up coming up with my own design, and am very happy with how it turned out! 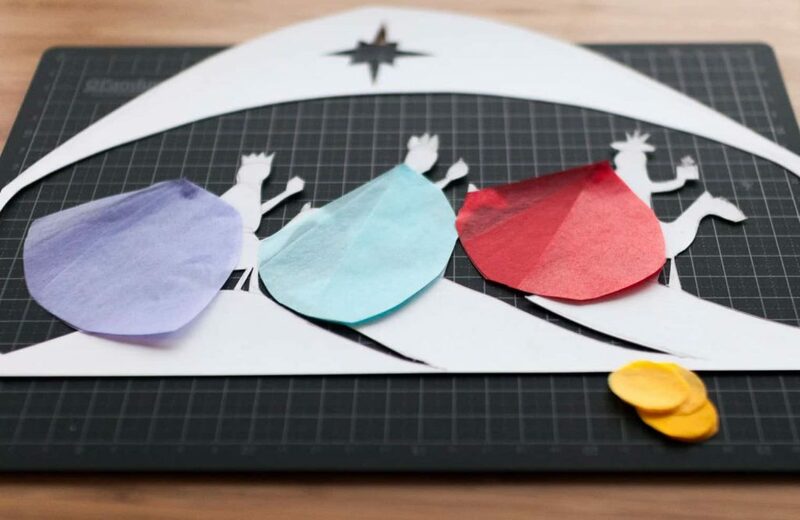 For this, you’ll need tissue paper, thick card stock, a Fiskars craft knife (or a pair of scissors and some patience), and glue. 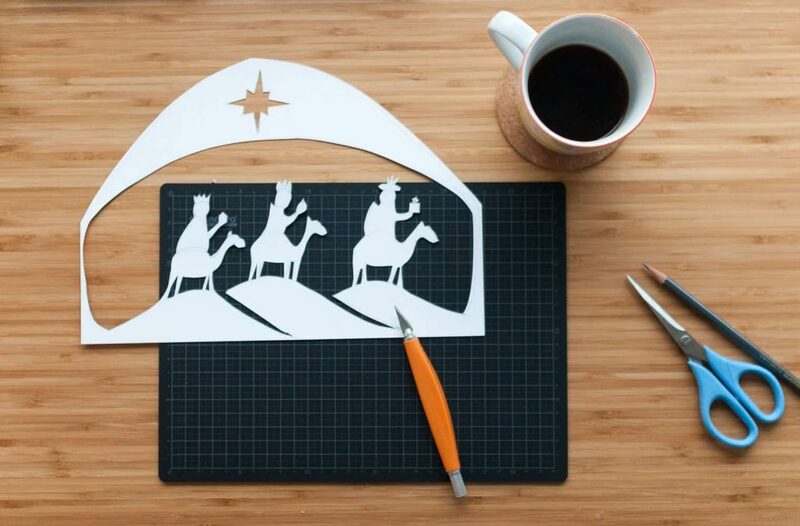 Turn over your card stock to the white side, and sketch out the design you want. Remember that it will face the opposite way when you’re done! 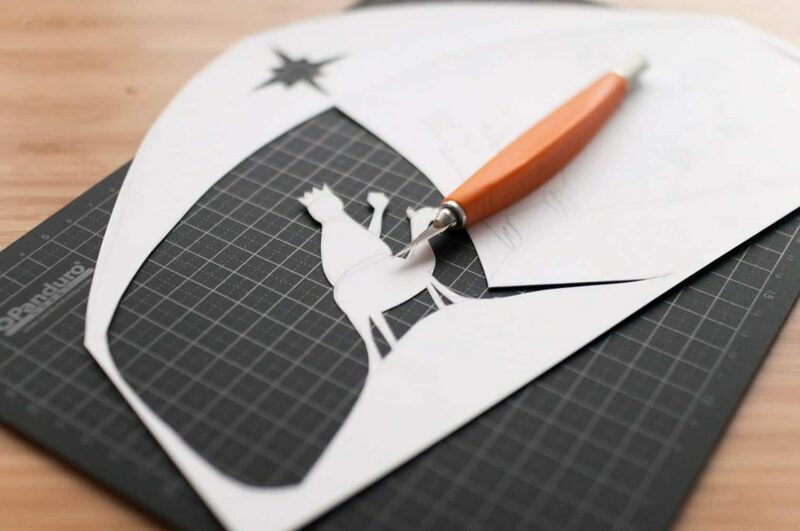 Using a craft knife or a pair of scissors, cut out your design. 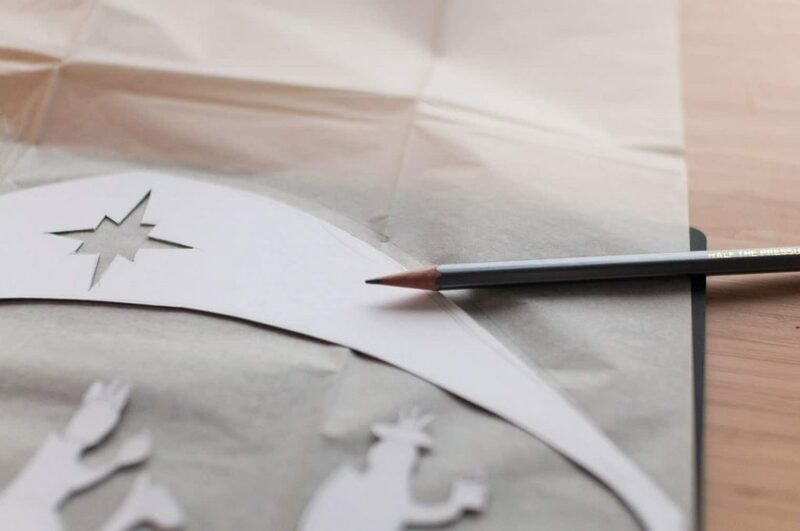 Trace the shape of the outer frame of the image onto a sheet of white or beige tissue paper. Cut it out and iron it to get out any creases. Also cut a strip of tissue paper, about 3 inches wide by 12 inches long, in three different colors. These will become the capes of the wise men. 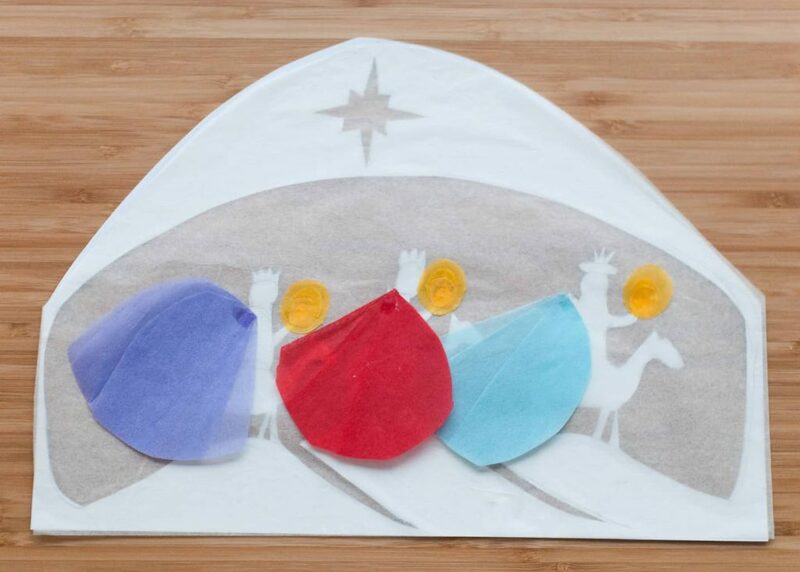 Fold the sheets into thirds, and cut out a rounded triangular shape to become the capes of the wise men. Fan them out in a way that looks like the layout you want, and glue them to each other, but not to the silhouettes yet. Glue down the white tissue paper first, then the capes. Next, cut three small yellow circles, three medium yellow circles, and three larger yellow circles from tissue paper. Stack them over the wise men’s hands so that it looks like they are holding gifts or glowing candles. 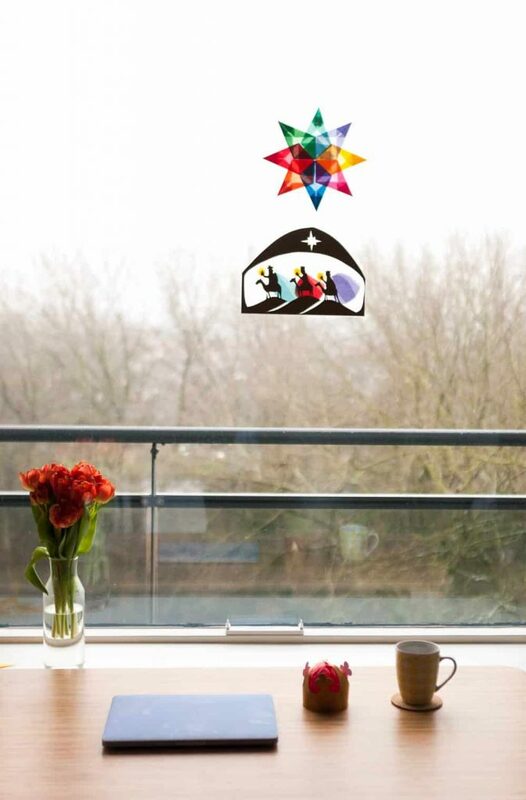 Now you can flip the design over and tape it to your window! It should look something like this. 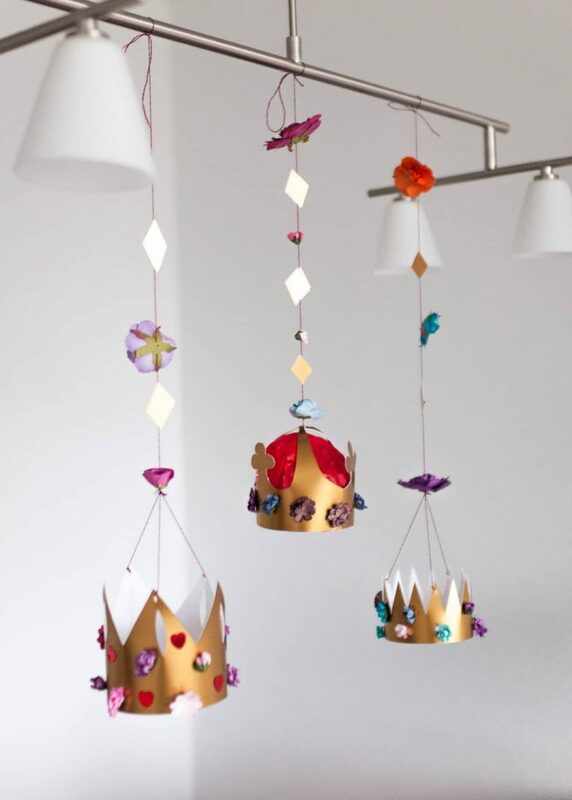 These were fairly easy to make and ended up being a really lovely whimsical addition to our dining area. Using gold-colored card stock and my Fiskars craft knife, I cut out three crown templates and added tissue paper inside one. 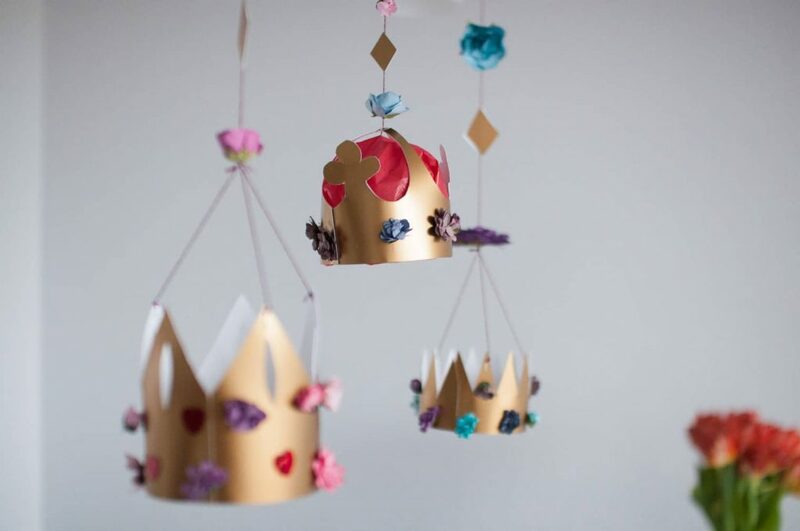 I then glued flowers and hearts to the crowns. Next, I strung them up with embroidery floss, adding flowers and squares from the card stock straps to the strings. I’m happy to make a more thorough tutorial if there’s interest! The numbers on either end are the first and last two digits of the current year. 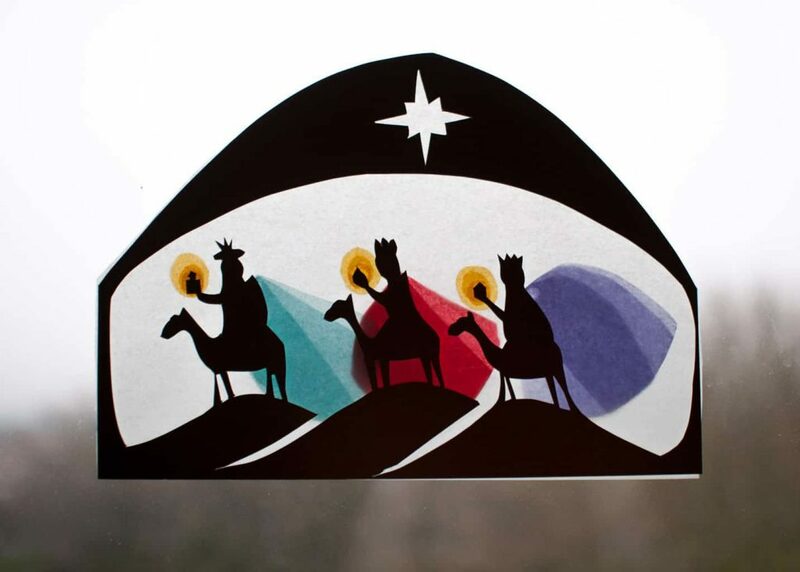 The letters in between stand for the names of the Three Kings: Caspar, Melchior, and Balthazar. 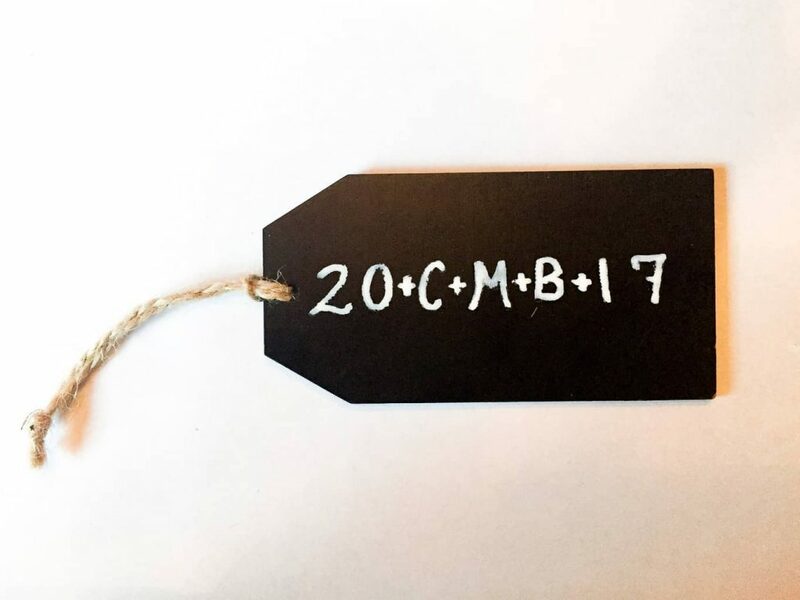 They also stand for the phrase Christus mansionem benedicat, which means “May Christ bless this house.” You can use chalk in the doorway of your house, or write on a chalkboard tag and tack it to the inside of the door. 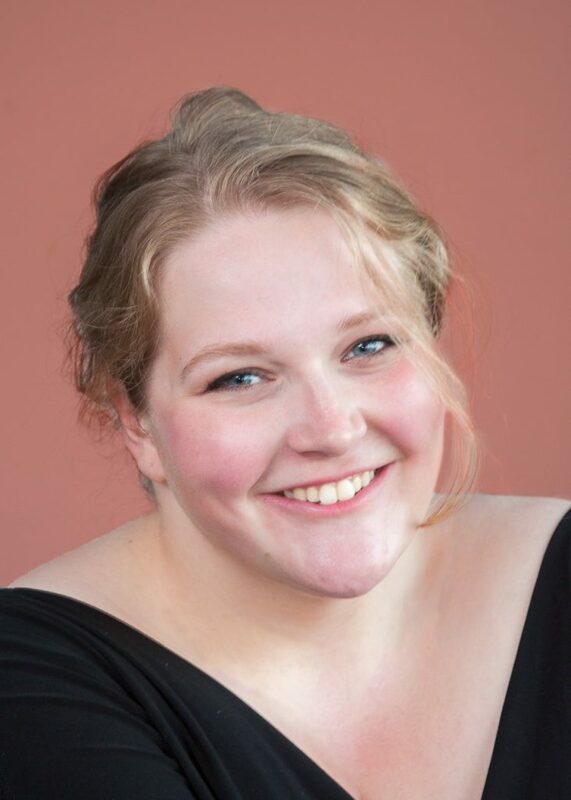 Music is very sentimental to me, and seasons of my life are closely tied to the music I listened to then. That’s why I love creating different playlists for different seasons, including liturgical seasons. Below is my Epiphany playlist. There are many songs relating to the themes of light or the three wise men that you could listen to in this season, so feel free to make your own playlist if you like! 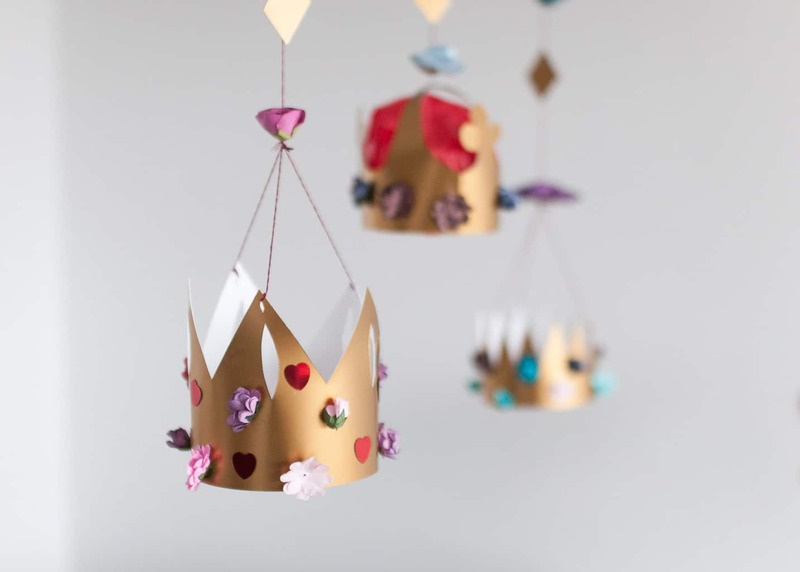 Whether you enjoy celebrating this season on January 6th or all the way until Mardi Gras, I hope these ideas inspire you to add some creativity and joy to your Epiphany season. Let me know in the comments whether you celebrate Epiphany and how you do so! Hi there Estelle! It’s great to hear that the post resonated with you. I took a look at many of the Galette du Rois cakes on Pinterest but wasn’t feeling quite adventurous enough to bake one yet. Do you have a specific recipe that you use? I’m glad you’re starting up the tradition again; family traditions are such a great way to build bridges across eras and decorations. I’m happy to hear that you’d be interested in a crown tutorial; I’ll see if I can put one together this week!